What the heck is up with Star Jones? Why does it look like she powdered her chest with a totally wrong shade, then put make-up on her cleavage to make her enormous breasts look bigger? Does she have fun house mirrors that actually make her look good? Because my eyes beg to differ. She used to work at McDonalds. Star Jones earned her B.A. degree in History & English at American University and a Doctor of Jurisprudence degree from the University of Houston Law Center. Star Jones started her TV career on CourtTV. In September 1998, Star’s first book You Have To Stand For Something, Or You’ll Fall For Anything was released and received widespread critical acclaim and became a bestseller. She launched her own not-for-profit foundation ‘The Starlet Fund’ in 2002. The foundation makes financial grants to individuals and organizations that are dedicated to the support and encouragement of women and girls in need. She was ranked #1 on Women’s Entertainment’s list of Bridezillas in 2004. She has her own “Star Jones” Signature Collection wig line. 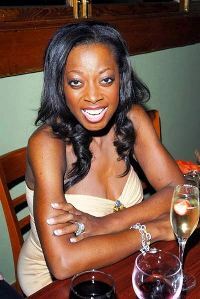 Her “Starlet” by Star Jones signature shoe line was launched in 2003 and is sold exclusively at Payless Shoesource. 48 queries in 0.626 seconds.